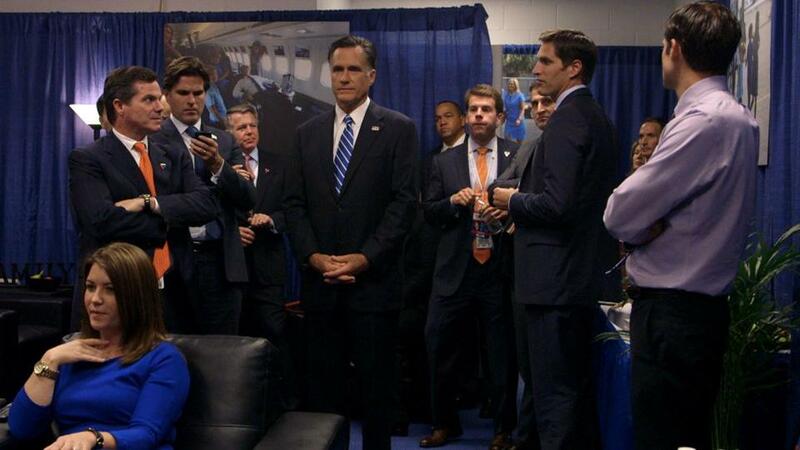 Mitt Romney was surrounded by family and aides after the second debate. 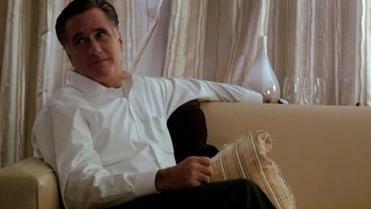 WASHINGTON — Mitt Romney sits on a couch in a hotel suite in Boston, surrounded by his anxious family. Someone calls to deliver the news: The returns are coming in and they don’t look good. You’ve likely lost the presidential election. “I just can’t believe you’re going to lose,” his son Josh says. “It makes your life much better, doesn’t it?” Romney replies. The climactic election-night scene is part of a new documentary that contains a wealth of behind-the-curtain footage from the Republican’s two campaigns for president, gathered by a filmmaker who for six years had extraordinary access to the former Massachusetts governor and his family. “What do you say — what do you think you say in a concession speech?” Mitt Romney wanted to know as defeat closed in. The up-close look, with the intimate feel of home movies, reveals a side of Romney that 2012 voters rarely if ever saw — a warm, even jocular family man, riding the emotional chaos of a grueling election. It shows him asking his family for guidance, leaning on them for laughter, or kneeling with them in prayer. It is a side that his oldest son, Tagg, wishes the public had seen. Instead, Romney typically came off on the stump as stiff and programmed. The 90-minute film — called “MITT” and created by Greg Whiteley, a filmmaker who earned the trust of Tagg, then Mitt Romney’s wife, Ann, and eventually Mitt — debuted Friday night at the Sundance Film Festival and will begin airing on Netflix next week. Romney and Ann, as well as their five sons, were in Salt Lake City on Friday night for the premiere of the documentary. Some Romney family members had seen earlier versions of the film, but Friday night was the first time they were going to see the final product. The movie contains no bombshells, but it does provide a far more textured look at the Republican presidential candidate more than a year after his name was on the ballot. There are intimate scenes (Romney in a bathrobe at a Radisson hotel, learning from campaign adviser Beth Myers that he won the Michigan primary in 2008) and moments of vulnerability (after his second debate with Obama in 2012, he said there was a moment where he felt like a student failing his SAT exam. “It’s like, ‘Oh no I’m going to flunk out. My life is over.’ ”) Several scenes show the Romney family bowing in group prayer while staying in hotels, moments that are interrupted by ever-chirping cellphones. There are scenes of the family sitting around before high-stakes presidential debates in the fall general election campaign. Before the first debate against Obama in Denver, in early October, Romney’s son Matt asked him if he would be intimidated, going up against a sitting president. That night, Romney had a great debate and Obama suffered a lackluster performance that gave the Republican a big lift in the polls and made the race closer in the last month. The filmmaker, Whiteley, like Romney, attended Brigham Young University and is Mormon. He made the 2005 documentary “New York Doll,” which is about Arthur Kane, a punk-rocker and recovering alcoholic who converted to Mormonism. Several in the Romney family, including Mitt, were fans of the film. So when Whiteley pitched the film on the candidate to Tagg — over a sushi lunch in Los Angeles — the family was receptive. But the campaign managers and operatives, both in 2008 and in 2012, were not. But because he had buy-in from the Romney family, Whiteley was able to gain intimate footage. “My rule was I was never going to stop filming unless someone named Romney told me no,” he said. “Mitt never seemed to have a problem with it. But I could tell it annoyed” his advisers. Whiteley says he tried to be a fly on the wall; he wasn’t firing questions at Romney, or asking him about gaffes or policy statements. But he said he didn’t feel compelled to protect Romney. “Six months ago we laughed at John McCain — laughed,” Romney says. “And now he’s most likely the nominee.” Romney wonders aloud who would go to any of his campaign events. Even he didn’t want to attend them. But the bulk of the film covers the 2012 presidential race. On Election Day, the film shows Romney on his campaign plane, tapping out lines of what he thought would be the victory speech. As they flew into Boston that night, the campaign felt it had done everything it could to win. Romney is cleaning up trash in the hotel when the results are streaming in. His sons are refreshing the Fox News website, updating the returns. One of his granddaughters tells him he lost Wisconsin. His campaign advisers tell him that, even though Republican operative Karl Rove is still holding out hope on Fox News, they have made it clear to Rove that it’s over. “OK, let’s do it then,” Romney says. He is shown with his iPad out, asking for help. “What do you say — what do you think you say in a concession speech?” he asks, as discussion turns to finding a phone number for Obama, to concede. Ann Romney later comes back into the room. “We’re writing a concession speech,” Romney says.